UPES Admission 2019 – With the release of the application forms, the University of Petroleum and Energy Studies (UPES) has stated the admission process for the academic session 2019-20. 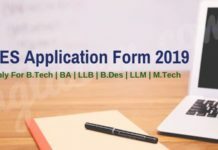 To apply for UPES Admission 2019 in courses like B.Tech, M.Tech, BBA, MBA, LLB, LLM, BDes, MDes, BCA, BCom, BSc, BA, MA etc the candidates have to fill the application form online at upes.ac.in. 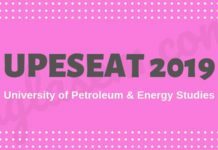 In addition to that, the candidates have to qualify the entrance exam of the University that goes by the name UPESEAT, ULSAT, UPESMAT, UPES DAT, UPESEEE. Also, UPES intakes admission based on national level entrance exam scores, interviews and direct admission based on qualifying exam marks. UPES is recognized by University Grants Commission (UGC) situated in the state of Uttarakhand. To know more about the university and its admission process, facilities, fee structure, courses, placements keep reading below. 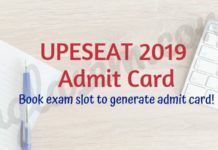 Latest: UPES Admission 2019 is open. To apply for various UG and PG courses – Click Here! ULSAT – This entrance exam is held for admission in Law programmes. UPES-DAT – For design courses. B.Tech / BE in the respective branch the candidates are applying for with minimum 60% marks. Science / Commerce stream in 10+2. Minimum 50% marks at Higher & Senior Secondary level (10th & 12th). The LLB and LLM course fall under the School of Law (SoL). The candidates can check below the minimum eligibility needed to take admission in the Law courses offered at SoL. Candidates claiming to take direct admission in the basis of board merit must have 65% marks in class 10 and 12 (Any Stream). Mode of admission: UPES-DAT / Board Merit / UCEED followed by Presentation of Portfolio and Interview. Mode of admission: UPES-DAT / CEED followed by Personal Interview and presentation on the work portfolio. Any applicant holding a passport of any country other than India, including applicants of Indian origin who are not Indian nationals/passport holders, are defined as International Students. Non-Resident Indians (NRI’s) or dependents of Non-Resident Indians who have studied and passed qualifying examinations from schools or colleges outside India are defined as International Students and entitled to enrol under this category. Dependents of NRI’s studying in India are not defined as NRI/International students. Students must fulfil minimum eligibility requirements as laid down for their chosen program at UPES. 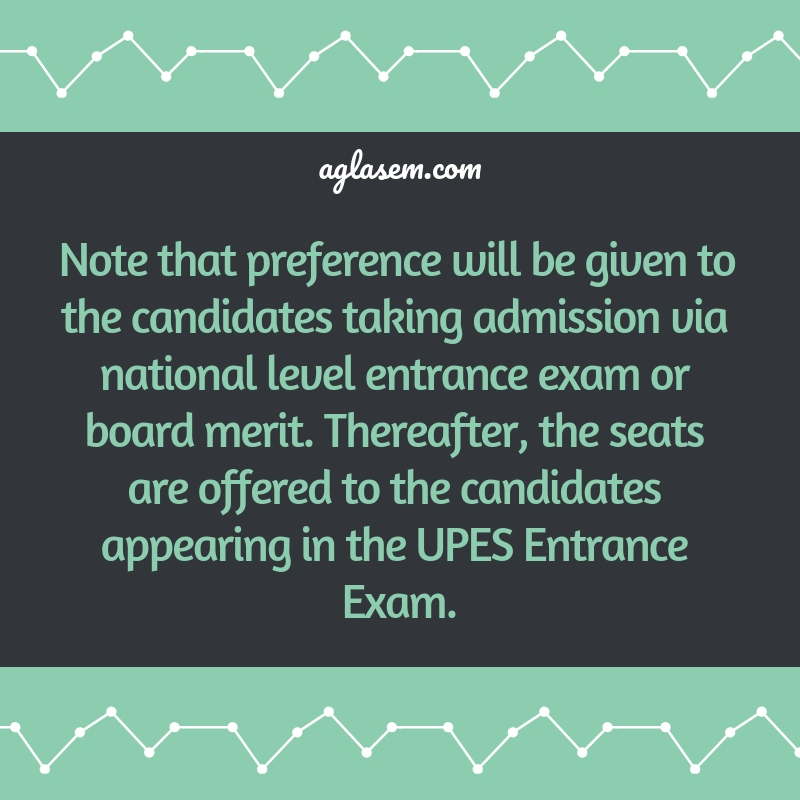 UPES must be satisfied that candidates applying for admission to undergraduate programs must have obtained higher secondary school certificate (with a minimum percentage of marks as prescribed) and taken requisite courses necessary to meet the eligibility criteria for the Program of admission. For admission to a postgraduate Program at UPES, the equivalence for the Undergraduate Degree earned by the candidate in his/her country shall be obtained from the Association of Indian Universities (AIU). In certain cases, students may be requested to obtain the necessary certification from AIU in this regard. School of Business: MBA programs: GMAT score of 600. School of Engineering: Undergraduate programs: SAT score of 1500/Postgraduate programs: GRE Score of 1700 (cumulative). Students from non-English speaking countries should satisfy UPES that they have adequate proficiency in English in order to be able to undertake the program of their choice. If required, an undertaking from such students shall be taken to undergo the English Language Training for a specific period of time (depending on the proficiency to be assessed by UPES on arrival) before starting the actual Program of admission. Qualifying TOEFL/IELTS or equivalent may not be mandatory but strongly advised. Students must possess a valid passport and Visa for the duration of the study. Click here to check the detailed Admission procedure for International Students. The University of Petroleum and Energy Studies (UPES) was established in 2003 through UPES Act, 2003 of the State Legislature of Uttarakhand. It is Asia’s first core sector university and is the first Indian institution to offer 79 graduate and postgraduate programs across 14 core sectors like oil and gas, power, infrastructure, information technology, transportation, electronics, high technology, design, business, planning and architecture, public policy and legal studies. These are just a few names, many other big recruiters visit UPES to recruit fresh talents. Scholarships for top rankers in the UPES Engineering Aptitude Test (UPESEAT): 6 Scholarships of Rs.50,000 each for students securing top ranks in the UPES Engineering Aptitude Test (UPESEAT). 3 out of these 6 scholarships are reserved for girl students.